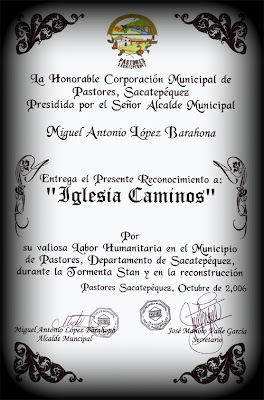 Last October, I was asked to recieve a reward on behalf of the church and the teams and the gifts that had been given to the city of Pastores. This is a little late in posting, but this comes to us from the Mayor of Pastores with a greatful heart. In short it thanks us for the help that we gave to the city of Pastores during a difficult time recovering from the effects of Hurricane Stan.